South Korea’s popular women’s curling team, who won silver medals at this year’s PyeongChang Winter Games, openly accused their coaches of workplace bullying including verbal abuse on Thursday. 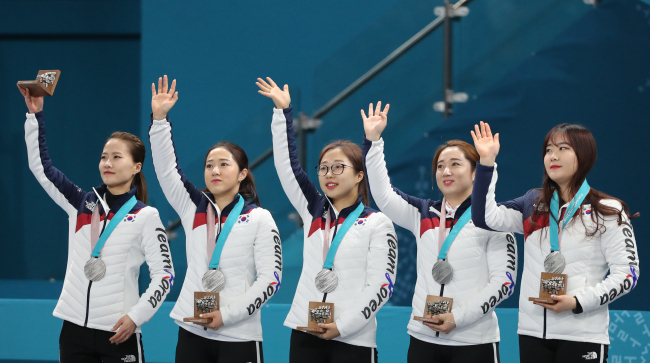 Better known as “Team Kim,” or the “Garlic Girls” -- the players all have the most common Korean last name Kim, and also all hail form the Korea’s farming region of Uiseong, known for producing garlic -- became a global sensation after surprisingly winning South Korea’s first Olympic medal in curling at PyeongChang. The Olympic heroes, however, revealed that they have been harassed by their coaches -- Kim Min-jung and Jang Ban-seok --, as well as Kim Kyung-doo, who is their coach Kim’s father and the former vice president of the Korea Curling Foundation. Coaches Kim and Jang are married to each other. The curlers, Kim Yeong-mi, Kim Kyeong-ae, Kim Eun-jung Kim Cho-hi and Kim Seon-yeong, sent a letter to Lee Kee-hueng, the President of the Korean Sport and Olympic Committee, requesting their coaches to be replaced -- saying they had been abused and exploited for their coaches’ personal gains. “We would like to continue our training (for the upcoming Beijing Olympics) without our current coaches and their influence,” the players wrote in their letter to Lee. In an interview with one of the public broadcasters, which was also aired on Thursday, the players also claimed that they were forced to make a visit to an event held at a day care center where their coach Kim’s son was attending. The curlers also claimed that the coaches took all the prize money they won in international competitions since 2015. “We believe we made at least 60 million won ($53,307) in 2015 alone, but we never received any of it,” they said. The players also said they were banned from using social media after the PyeongChang Games. They also said Kim Eun-jung, the captain and skip of the team, was made to train by herself after the Olympics, without clear reasons. Coach Jang has denied all of the allegations. He said the prize money was used to cover the team’s expenses, such as plane tickets and equipment purchase. “I showed the record of the expenses to the players on July 3, and they signed it,” he said. He also claimed that all the profits made at public events post-Olympics was wired to each of the player’s personal bank account. About the claim that the players were forced to attend his son’s day care event, Ban said although it’s true that Kim Yeong-mi and Kim Seon-young were there, he had asked for their consent in advance. The Ministry of Culture, Sports and Tourism and the Korean Sport and Olympic Committee announced Friday that they would investigate all of the allegations.